Last week I posted my Ruff Puff pastry, and now here is one of my favorite ways to use it. The filling is not too sweet, and you don't use much of it, so this is a pastry I can feel good about eating for breakfast as well as dessert. Perfect with a cup of tea (or coffee). You can make the filling, as well as the puff pastry, two days ahead; so they can be made very quickly whenever you like. I like to make four now and four later. Just cut the finished pastry in two and roll out one half now and refrigerate or freeze the other half until you're ready for it. Same with the filling. Get ready to hear "You made these yourself?!" Yes, your friends will think you're some kind of genius. Let them! Tell me, what do you like to make that always wows people? 1 Peel, quarter and core apples. Cut each quarter in half lengthwise and into 1/4-inch-thick slices. Put in a 2-quart saucepan. Stir in lemon juice to keep apples from turning brown. 2 In small bowl, stir together sugar, flour, cinnamon and salt. Stir in dried cranberries, separating any that are clumped together. 3 Pour dry mixture over apples in saucepan; stir to coat. Stir in water and butter. Bring to a simmer over medium heat, stirring constantly. Reduce heat and simmer until apples are starting to get tender and liquid is thickened and reduced, about 10 minutes (5 minutes covered, 5 minutes uncovered), stirring frequently. Set aside to cool; cover and refrigerate until ready to use. 4 Roll the puff pastry into a 20-by-10-inch (trimmed measurement) rectangle. Cut the dough into eight 5-inch squares, and place the squares on two parchment-lined baking sheets. Put a 1/8-cup portion* (that's 2 tablespoons) of filling in the center of each square. Cover with plastic wrap and refrigerate. Bring out one sheet at a time to keep pastry cold. If your kitchen is very warm, bring out one pastry square at a time. Note: Portioning out the filling all at once before any folding and crimping is done prevents you from running out of filling before you run out of pastry squares! 5 Using a finger or a pastry brush, wet the edges of a pastry square. Fold pastry in half diagonally and press edges with a fork to seal the edges together. Place turnovers on large parchment-lined baking sheet. If you don't have a really large baking sheet, use two or bake in two batches. Once all are assembled, check to make sure the sealed edges are holding. 6 Brush with milk and sprinkle with cinnamon-sugar. Or do an egg wash, if you prefer, with an egg beaten with a tablespoon of water. With sharp knife, make three small slits on each turnover. Cover and refrigerate for 15 minutes while oven preheats to 425 degrees. Or refrigerate for several hours. 7 Bake at 425 degrees for about 20 minutes, or until golden brown. Serve warm or at room temperature. Savory aroma reaching me here in Montana. 5 cleavers! Ooohh, I can definitely see how this would be your favorite filling! Love the cranberry/apple combination! Sully, thank you for taking time to look at my blog while you're on the road again. Happy trails! Thanks, Jenn! Of course, with puff pastry turnovers, it's all about the pastry; but still, you want that little bit of filling to be tasty. Hi Jean. Wherever I have lived we have always had a selection of apple trees in the garden. Imagine writing a poem or a story where you included the names of . "English," apples. Here is a selection of apple names you may well hear spoken of in apple growing regions like Devon , Cornwall, Kent, Somerset (where the cider apples grow) and Herefordshire. Just think, you could spend a lifetime exploring, growing, writing about, tasting and making delicious things just with apples. Thanks, Tony! Ever since I had a Cox's Orange Pippin in England, I've wanted to have ready access to that apple. It would indeed be such fun to explore your entire list! Thanks, Mary! And I agree - cranberries are ignored most of the year - but not by me! I use them - fresh, frozen or dried - year round. Thanks, Bonnie. I wonder if you're like me and ALL your best childhood memories revolve around food! Jeri, such a deal! My husband did most of the day-to-day cooking for a few all-too-short years, but he never really took to it. He got bored with his limited repertoire and was happy to get me back on the job! Jean, it has just occurred to me that you might have problems with your triangular apple turnover in Britain. Have a read of this article in the Guardian and all will be revealed. ha! ha! Tony, what a hoot! I thought such silly "protective measures" were only taken in the US! But I don't think a triangular turnover would do as great an injury as a triangular flapjack! Thanks so much, Greg! That's quite a compliment coming from the pie guy! 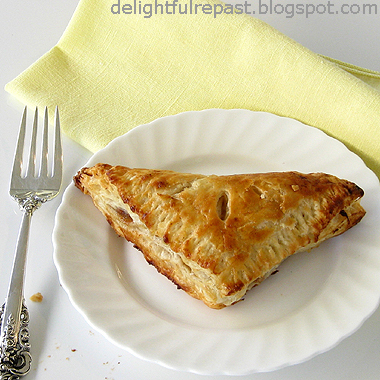 That turnover looks delicious. I'm sitting, having a coffee and now I'm craving a turnover to go with it. Yum! Thanks, Christina! I'll have to make another batch - can't look at the photo without wanting one!